Weighty Matters: Which Canadian health authority wants you to eat poutine, Velveeta and nachos? Which Canadian health authority wants you to eat poutine, Velveeta and nachos? 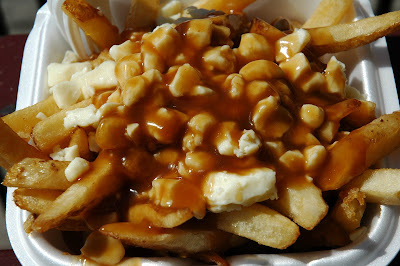 For my non-Canadian readers that photo up above is known as poutine, and it's French fries, smothered in cheese curds, smothered in gravy, and it's a bone of contention for Registered Dietitian Natasha McLaughlin-Chaisson. Looking through Osteoporosis Canada's website she came across their list of foods that were good sources of calcium. Well poutine of course, and also Velveeta, and nachos with cheese. Kraft Dinner, pizza, and ice-cream make it onto the list too, albeit as lesser sources of calcium. Now one way to read this, is that all Osteoporosis Canada is doing, is providing the calcium information of what they refer to as, "Common Foods" - foods we're eating anyhow. Of course another way to read this is the way Natasha did, whereby she wonders whether or not their inclusion as high sources of calcium might represent an endorsement from Osteoporosis Canada, who in turn are nutritionally whitewashing the consumption of poutine, Velveeta, nachos and ice cream in the name of calcium. Natasha's right, and I'll tell you why. Natasha contacted Osteoporosis Canada with her concerns. After much run around she was told that the inclusion of the nachos and poutine will be looked at by a committee when they got a chance, but that one of their dietitians had approved their inclusions. So? No slam dunk there, that doesn't mean their list is meant to encourage consumption or steer people to specific choices, it just means they've got a rather eccentric dietitian working for them. "it is a good source of calcium especially with children who dislike milk"
Therefore it's indeed Osteoporosis Canada's list of "good" sources of calcium, as if it were just a list meant to serve to inform folks about the calcium content of common foods, that argument wouldn't have been put forth. And what does the evidence say about dairy, children and bone mass? Well a recent 2005 meta-analysis published in Pediatrics didn't think dairy was worthwhile, though critics will leap at the fact that it was authored by Neil Barnard, a known anti-dairy crusader. Of course there was also a 2006 BMJ meta-analysis that concluded pediatric calcium supplementation was also not helpful. Personally, I can't imagine any proponents of dietary calcium (other than apparently Osteoporosis Canada) who would suggest calcium's so important that parents of non-milk drinking children feed it to them via ice-cream, or that adults should aim to get theirs from poutine, nachos and Velveeta. And as far as adults go, ample evidence exists to suggest that increased dietary intake of calcium, doesn't seem to have any clinical impact on reducing the risk of osteoporotic fractures (see citations below). The kindest thing I can say is that perhaps by including these foods Osteoporosis Canada is hoping that the increased weight of a person who eats them regularly will in turn serve to naturally increase their weight bearing activity - something that unlike dietary calcium, will most assuredly reduce their risk of osteoporotic fracture.